Your Chimney is a water hazard if not maintained. We are big fans of the May flowers, but we’re more concerned with something else April showers can bring: indications of serious damage to chimneys. We often sound the alarm about fire danger, but prolonged exposure to water is just as big a concern when it comes to chimney safety. When your masonry or factory-built fireplace is exposed to water, the result can be cracks or gaps in your chimney where creosote can collect and increase the risk of fire or where noxious gases can escape into your home and expose your family to carbon monoxide. Rust stains: More particular to factory-built fireplaces, rust is a critical red flag that water is accessing your chimney and threatening the integrity of the structure. Rust stains could reveal themselves around the outside of the upper chimney, or along the inner lining of the fireplace. “Rust stains in the fireplace area are of serious concern. Like the tip of an iceberg, by the time you see the evidence down in the fireplace, water damage to the damper or upper chimney structure is likely very critical,” says Ashley Eldridge, the CSIA Director of Education. Dripping or standing water: This may seem obvious, but water pooling anywhere in or around your masonry or factory-built chimney and fireplace structure means water has an access point to your home. Bent or damaged flashing: The metal materials used to help seal your chimney from rooftop water runoff must be flush to the chimney structure. Flashing, crickets or other devices can warp or otherwise separate from the chimney over time, exposing your structure to water. Use a chimney cap: Sometimes called a rain cover, a chimney cap works to protect your chimney the way your roof works to protect your house. 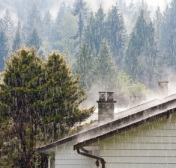 Water has direct access to your home when a rain cover is not installed on your chimney. Apply waterproofing agents: Particular to masonry chimneys, adding a vapor-permeable waterproofing agent to you chimney’s interior lets moisture escape, but prevents it from coming in. Be sure to never use paint or any non-vapor-permeable water sealer because it will trap moisture inside the chimney, hastening deterioration. Call a CSIA Certified Chimney Sweep: To perform the recommended jobs above or any other repair work on a leaky chimney, there are no professionals more qualified than our certified sweeps. Find your local sweep at csia.org/search.